Turkmen carpets and carpet-like items have clear functions-- khali (carpet), torba (bag), iolan (band), and so forth. One, however, may not be so straight-forward, the engsi. It is useful to get at meaning via etymology, but in this case, perhaps not possible. Radlov's great Turkish dictionary3 does not include the term. In any event figuring out what if anything the word reveals is a matter for specialists; a clue might be that it may come from Persian.4 A Turkmen participant at the 1996 Askabad conference presented an illustrated overview titled "Origins of Turkmen Motifs". One particular in this wide-ranging talk about carpet types, designs, influences, and the like was a thought provoking comment that engsi is an ancient term for either an Iranian ruler or a place for a temple. This is apparently a fresh idea and worth a follow-up by someone with requisite skills. Please click on the small images to enlarge. 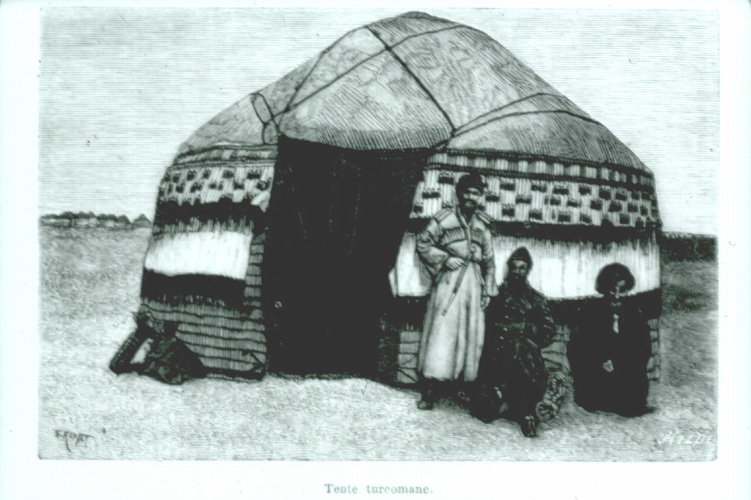 Turkman Yurt, Third Quarter 19th c.
In brief, the late 20th century view of door closings is too narrow. The common door curtain canard gained a bit of mileage by the unearthing of an 1885 newspaper sketch showing an apparent engsi covering a yurt entrance in Pendeh oasis.21 Not brought to notice, however, was a second illustration in the same hamlet showing a doorway covered by a fabric, not an engsi. 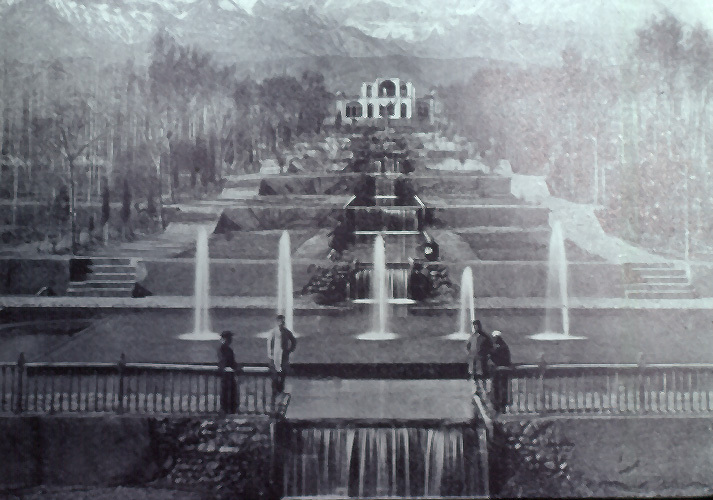 (Figure 9) (Figure 10) Also overlooked was the occasion which brought the correspondent, a visitation by the Afghan Boundary Commission, along with the fact that the newspaper text was written not by the correspondent but by editors in London. Here, one needs to remember that Western and Central Asia building exteriors frequently were decorated with textiles on special occasions. Because of this, door curtains in evidence on any given day can not confidently be taken for ordinary use. 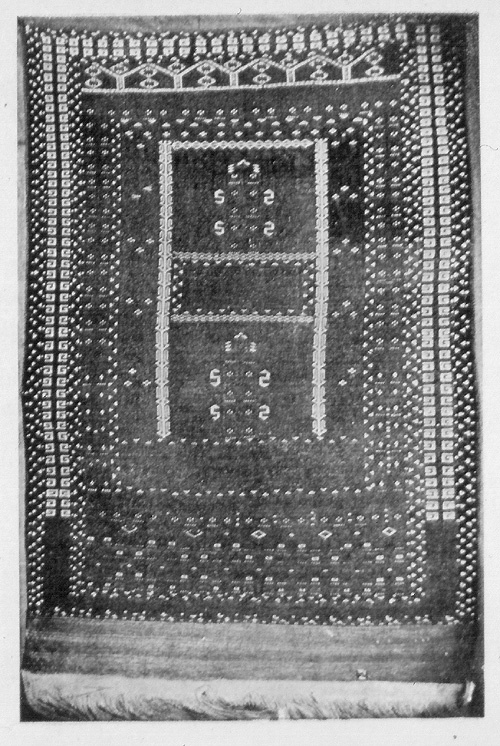 An 1885 report of this visit also notes a "hanging carpet"22 which could have been either engsi or fabric. 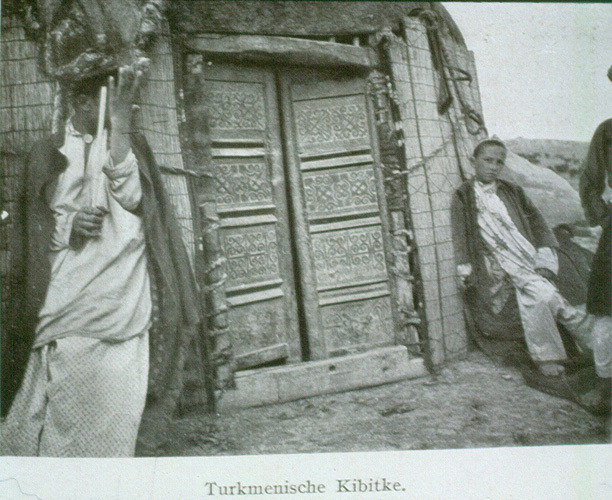 The sketch is one of the scant Turkmen evidences (there are a few Kazak and Khirgiz) of an engsi in a doorway. Richard Isaacson of the International Haji Babas has garnered some of these photos. Upshot, to tout one as “rare” certainly makes a point, but it isn’t the photo which is rare;23 it is the doorway engsi. An explanation of such dearth, of course, would be interior use. And, interior photographs of both Kazak and Khirgiz dwellings show decorated hangings (reed mats, textiles) on the inside of doorways. 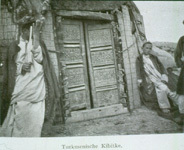 (Figure 11) Photographs of Turkmen interiors, however, seemingly seldom come to light. This is his significant observation, not his comment about the objects being pretty and pricey. 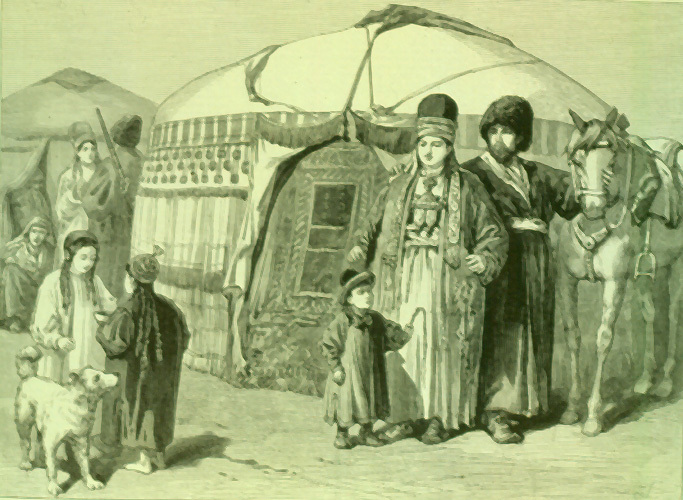 Late 19th c. Saryks, in the far southeastern corner of Turkmen territory, were the clans at greatest remove from their kin, the Russians, and European markets. Whether the makers of these engsis were Saryks, as some of the older rug books thought, or Salors is not of interest; both were in the area, the diminished Salor for the most part across the Persian border, but of the local culture. What to make of this remoteness isn’t clear; one reasonable thought is that perhaps Saryks and Salors clung longest to the old ways and that the engsi after all was intended for door use. 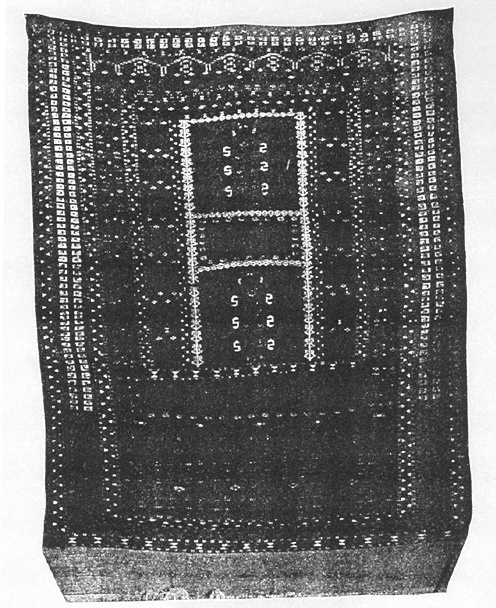 Getting at original purpose is a difficult business; in this regard there are hints that this may have been as a prayer rug. On this score, however, the setting is inhospitable. 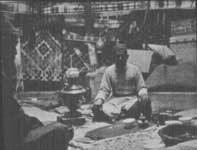 Turkmens were nominal Mohammedans and not observers of ritual; turn of the century travellers and writers about carpets noted that Turkmens did not perform ablutions, nor build mosques, nor use prayer rugs.25 Not a promising milieu for the engsi as prayer space. The image on the rug -- a mihrab -- was known to Uzbegs as a pishtak (gate), and the two TV antenna-like lines (regularly atop mihrabs) were seen as a "stork's nest".26 The same embellishment occasionally appears in Anatolia. 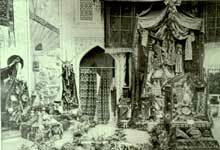 Substantial weaving in the Bukhara khanate began only in the 1870's,27 and shows obvious Persian inspiration. While the Bukhara prayer rug comes in part from Turkmen weavers, it stems from an external tradition. A 1930 explication of Turkmen carpet ornamentation published in Asgabad unblushingly calls the engsi principal motif a mihrab.31 While some latter day Soviet authors do not like the word,32 others have no fear of it;33 the Moshkova compilation (c. 1940) uses it at least 10 times. If one wishes to, bands and mihrabs may be seen on the engsi’, but so can other things. 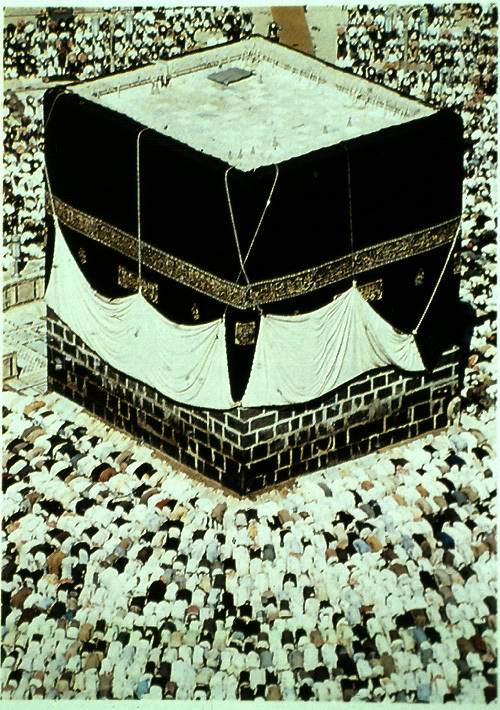 The need to tell the infidels something hardly means that a claim that the Kaaba is the source makes it so. Early travellers to Persia, for example, were told that a mihrab was a representation of the dome of a mosque. But a garden also is an appropriate (heavenly) image for a prayer space, and gardens in western Asia with walkways and water courses can be seen on the engsi. (Figure 19) Scribes in the West have occasionally indulged in thoughts that what is represented thereon is the cosmos, also a favorite pastime of Turkmen researchers. A bit of a stretch but within the bounds of speculation, but to base such thoughts, as some do, on the secondary and tertiary motifs is to enter a quagmire. 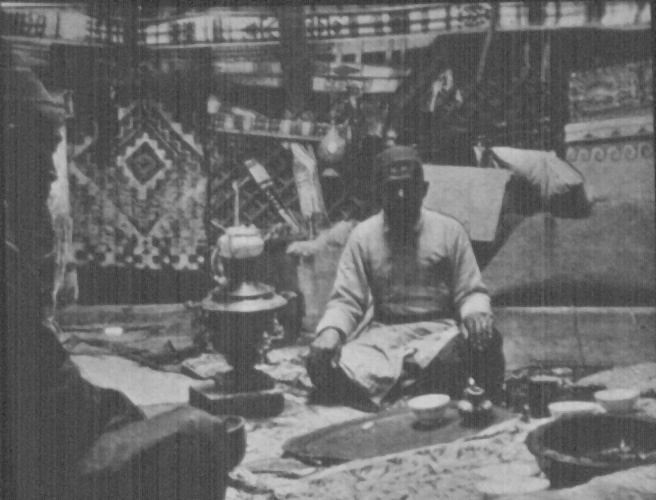 Some Turkmens may have used prayer carpets, Dudin having mentioned the Salor and the Yomud.38 Yet Transcaspia (Figure 20) kustar' summaries from 1882 -- 1914 (serial reports on government-supported home craft industries) use the term namazlik only in the district (Krasnovdosk) which had an essentially Yomud (along with some Chodor) Turkmen population.39 This difference could have arisen merely from inconsistent nomenclature among the five administrative districts, but nevertheless may point to something other than engsis having been made in Yomud territory as prayer carpets, something hinted at by an 1892 comment on the work of Yomud women in a particular district, Karakalin, which noted prayer carpets “in beautiful and various” designs using cotton for white.40 For Krasnovdosk in 1900 reports state that prayer carpets constituted 38% of pile rug production, and in 1911, 61%. The rug counts in such documents are modest, only hundreds per year. Another compilation, in a special fact-finding survey, recorded all Transcaspia rug production in 190841 and reported a prayer carpet share of 30% (738 rugs). 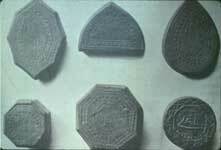 Felkersham calls a small hexagonal rug with a field dominated by a niche shape an Orgurjali prayer carpet.42 (Figure 21) (Orgurjalis were Yomuds.) Within the niche image is a small five-sided motif; if this is thought of as of a representation of a Karbala briquette the rug would be Shiiah, which is possible, for Turkmens in the vicinity of Asterabad were Shiiah.43 Also present on the image are the two small antennae. (Figure 22) It needs quickly to be said that other members of this genre do not have the possible brickette image. Soviet authors call very similar items saddle cloths.44 One unaccountably cites the Felkersham illustration as an "Ersari horse trapping? "45 An explanation, per Occam’s razor, ie, use the simplest, is that the field was determined by the rug’s hexagonal shape, this in turn dictated by horse anatomy. But this answer does not attend to the possibility of a Karbala brickette image, there by weaver choice, not the horse’s. 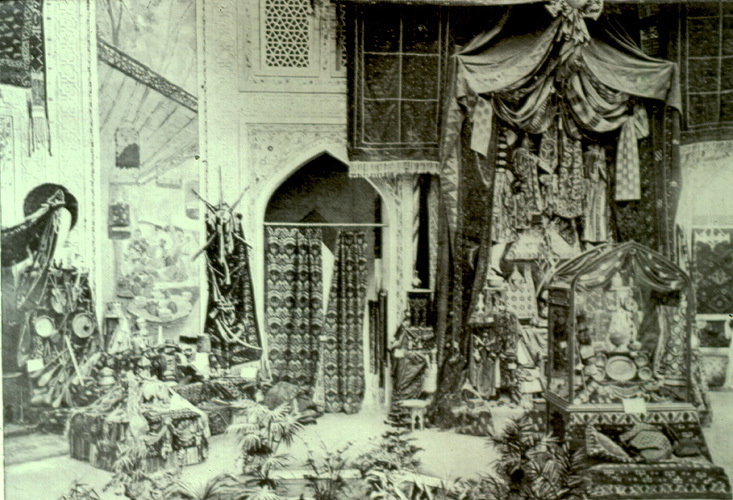 The foregoing sketch does not show what the engsi was or is, but rather contains bits and pieces of possibilities: the apparent absence of niches in the putative Yomud oeuvre, presence or absence of antennae atop mihrabs, the mention of prayer rugs in Yomud country conceivably not in engsi format, and so forth. All of which seems to point to the value of further inquiry. For, indeed, the rug bazaar's “common furniture” cliché trivializes what may be a significant material cultural artifact. The data underline a self-evident proposition: the past can never be characterized by simple projection back from the present. In brief, the mix of observations is rich: -- mihrabs, Karbala brickettes, Kaaba coverings, horse furniture, namazliks -- with their traces clouded by the passage of time and Soviet repression of national consciousness of the peoples of Central Asia. 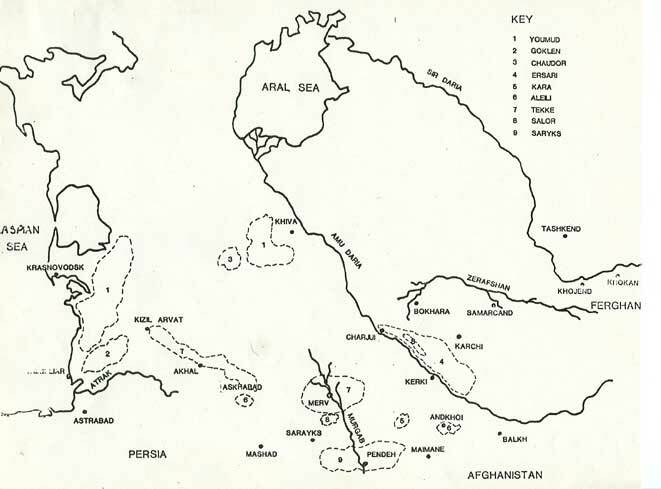 Much needs a better look; there are substantial matters – religiosity, commerce, the cluster of engsi references to the Pendeh area, and the fact that an allusion to the Kaaba is abundant in period literature. A good deal to think about. In the meanwhile, it is instructive to remember an elderly Central Asian weaver's question to George O'Bannon: what is all this engsi business? We just called them prayer rugs. 1...... Turkmensko-russkii slovar', Baskakov, N. A., Karryev, B. A., Khamzaev, M. Ia., eds., Moscow, 1968, p. 79; Turkmen dilining sozlugi, Khamzaev, M. Ia., ed., Ashgabat, 1962, p. 814; Turkmensko-russkii slovar', Akademiya nauk, Leningrad, 1968, p. 185, p. 307. 2….Dudin, “Kovry Srednei Azii”, Stolitsa I Usad’ba, No. 77-78, March 30, 1917, p. 11; Felkersham, Baron A., “Starinnie Kovry Srednei Azii”, Starye Gody, Apl – May, p. 76. 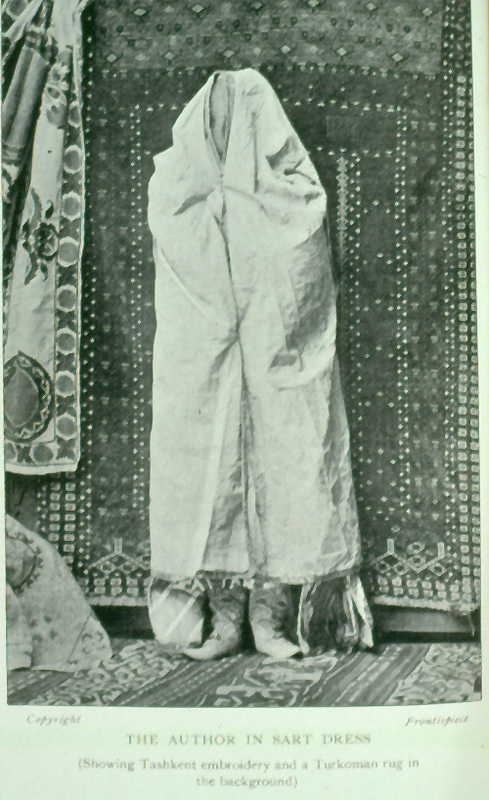 3...... Radlov, V. V., Opyt slovartia tiurkskikh nariechii, St. Petersburg, 1893 -- 1911. 4.....Gulbalyev, no abstract, lecture notes. 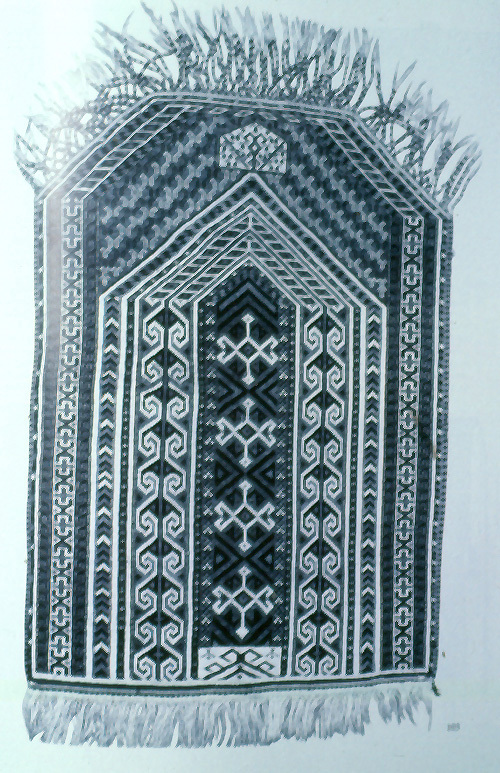 N. M. Niyazi's paper, "Origin and History of Denomination of Turkmen Carpets' Ornaments", abstract, lists some of the current religiosity ideas concerning the engsi design and motifs -- the Kaaba, Mohammed's grave, etcetera. 5...... Desmaisons, Petr. I., History of the Mongols and the Tatars, by Ebulgazi Baradin Khan, Khivan Khan, 1603 -- 1664, after a manuscript in the Asiatic Museum, St. Petersburg (1871--74), Philo Press reprint, Amsterdam, 1970, p. 337, p. 338. 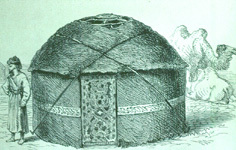 6...... Moshkova, V. G., "Plemennye 'goli' v turkmenskikh kovrakh", Sovetskaya etnografiya, 1946, Moscow/Leningrad, p. 147. 7….Neumann, Helmut, “Turkomania Meets Science”, HALI 104, pp. 82—85. 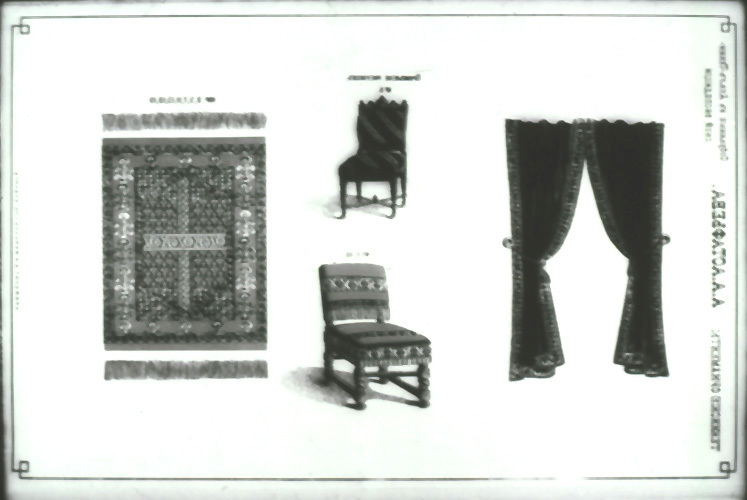 8...... Khodzhamakhametov, N., and Dovodov, N., Carpets and Carpet Products of Turkmenistan, Askhabad, 1973, p. 139. 9...... Pinner, R., and Franses, M., "The Animal Tree Ensi", Turkoman Studies 1, London, 1980, p. 135. 10...... Pinkerton, John, "The Remarkable Travels of William de Ruberuck", Voyages and Travels, 1811, Vol. 7, p. 28; Bergeron, Pierre de, Voyages, including Plano de Carpin (1585), Paris, 1830, p. 157; Brocherel, Jules, "The Kirghiz", The Scottish Geographical Magazine, Vol. 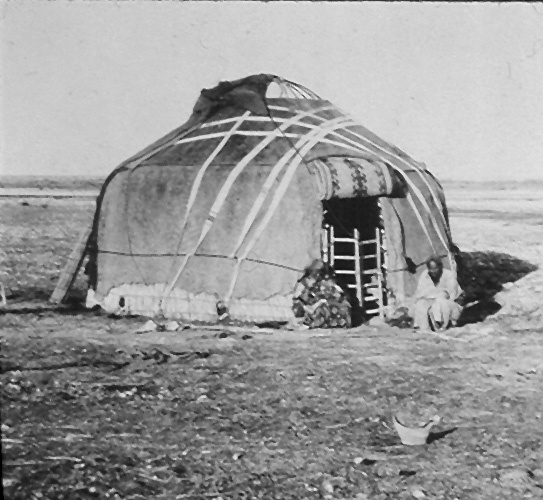 V, p. 399; Curtis, William Eleroy, Turkestan, The Heart of Asia, New York, 1911, p. 116. 11…Felkersham , Baron A., op. cit., p. 76. 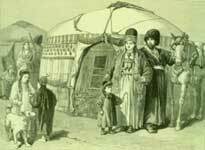 12...... Cholet, Pierre, Excursion en Turkestan, Paris, 1889, p. 210. 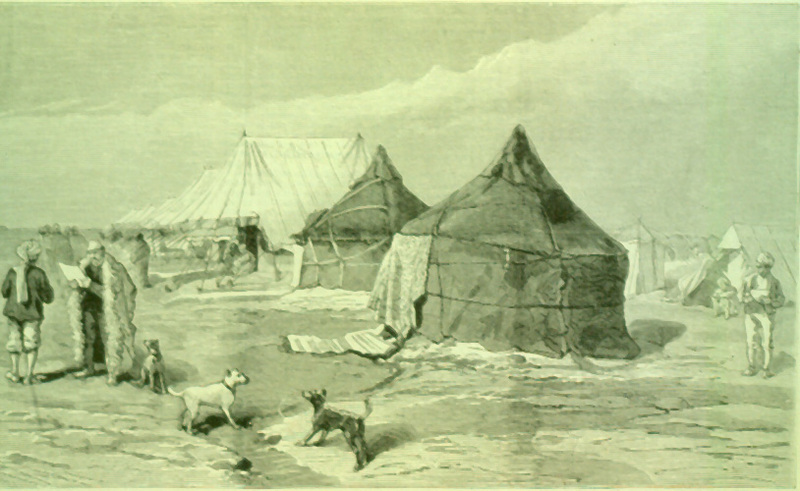 13….Aucher Eloy, Remi, Relations de Voyages en Orient, (c. 1830), Paris, 1843, p. 532. 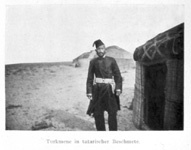 15...... Olufsen, O., The Emir of Bokhara and His Country, (1898), London, 1911, p. 324. 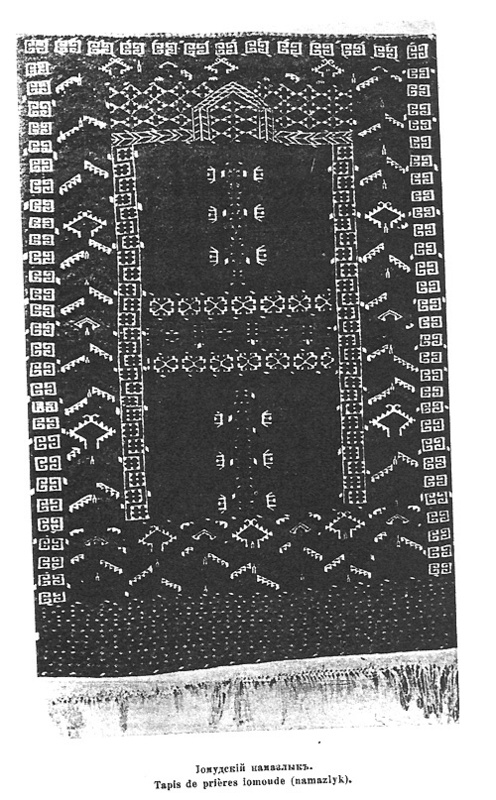 16...... Tzareva, Elena, Rugs & Carpets from Central Asia, Leningrad, 1984, p. 14. 17….Lessar, P. M., Yugo-zapadnya Turkmeniya, 1885, p. 53. 18...... Astaf'ev, A. A., Tekinskie Ornamenty c ikx primlneniem dlya Kovrov, Vyshivok i proch., 1885. 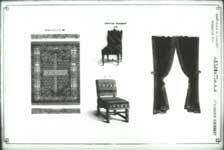 19......Lownds, G., "The Turkoman Carpet as a Furnishing Fabric", Turkoman Studies II, ed. Franses, Michael and Pinner, Robert, London, 1980. 20...... Adamov, A. V., Sovetskie Kovry i Ikh Eksport, Moscow-Leningrad, 1934, p. 19. 21...... The Illustrated London News, March 28, 1885, p. 31; Moran, Neil, "Saryk ABC", HALI, May 1997, p. 71. 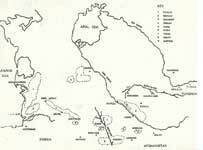 22......Proceedings of the Royal Geographic Society, Afghan Boundary Commission, Geographical Notes. III, New Series vol. 7, 1885, p. 282. Robert Pittinger of New York kindly shared this information. 24...... Felkersham, op. cit., p. 95. 26...... Olufsen, O., The Emir of Bokhara and His Country, London, 1911, p. 546. 27...... Felkersham, Baron A., op. cit., pp. 34--37. 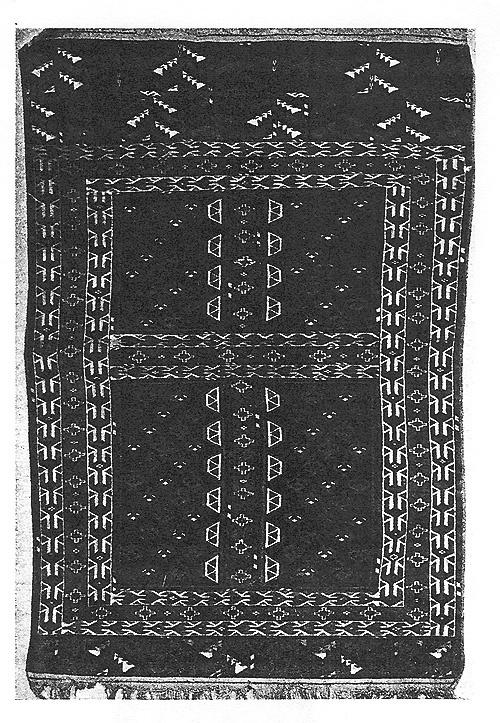 28...... Dudin, S. M., "Kovrovye izdeliya Srednei Azii", Sbornik Muzeya antropologii i etnografii, V VII, Moscow, 1928, p. 88; Dudin, S. M., op. cit., p . 11; Yampolsky, I. P., "Kustarnoye delo", Asiatskaya Rossiya, V II, St. Petersburg, 1914, p. 398; Dmitriev-Mamonov, A. I., Putevoditel' po Turkestanu, St. Petersburg, 1903, p. 115. 29...... Felkersham, op. cit., p. 72, p. 82, p. 83. 30...... Khodzhamakhametov, N., and Dovodov, N., op. cit., p. 139 ff. 31...... Ponamarev, O., "Motivy Turkmen c kogo ornamenta", Turkmenovedenie, #7/9, 1931, pp. 92 -- 96. 32...... Tzareva, Elena, op. cit. 33...... Gogel, F. V., Kovry, Moscow, 1950, p. 34. 34...... Palen, K. K. Mission to Turkestan, trans. N. J. Couriss, London, 1964, (trip, 1908--1909), p. 65; Yampolskii, I. P., op. cit., p. 398; Dmitriev-Mamonov, A. I., op. cit., p. 115; Felkersham, op. cit., p. 96. 35...... Niyazis, N. M., Devlet "Tyrkmenkhaly" birleshigi, Asgabad, May 1996, unpublished abstract. 36...... Maundrell, Henry, A Journey from Aleppo to Jerusalem, at Easter A. D. 1697, Oxford, 1732, p. 394; Tournefort, J. P., Relation d'un Voyage du Levant, Lyons, 1727, Vol. II, p. 350, p. 358, p. 359; D'Hosson, Chevalier de, Tableau General de l'Empire Othoman, Paris, 1788, Vol II, p. 510; Wittman, William, Travels in Turkey..., London, 1830, p. 318. 37...... Nassiri Khosran, Relation du Voyage, trans. Chas. Shefer, Paris, 1881, p. 200. 38......Dudin, S. M., (1926) op. cit., p. 117, p. 127, p. 135. 39...... Obzor Zakaspiiskii oblasti za 1900 gode, Askhabad, 1902, pp. 100--117; Obzor Zakaspiiskoi oblasti za 1911 g., Askhabad, 1915, pp. 207--212. 40… Obzor Zakaspiiski oblasti za 1892 g., Askhabad, 1893, pp. 91 – 92. 41...... Yampolskii, I. P., op. cit., p. 399. 42...... Felkersham, op. cit., p. 108. 43...... Pinkerton, John, Voyages, Vol. IX, 1811, p. 329. 44...... Khodzhamukhamedov, N., and Dovodov, N., op. cit., p. 106; Tsareva, Elena, op. cit., p. 47. 45......Tsareva, Elena, op. cit., p. 152. 46...... Lentz, Thomas W., and Lowry, Glenn D., Timur and the Princely Vision, Washington, 1989, pp. 216 - 218, pp. 220 -221. 47...... Briggs, Amy, "Timurid Carpets", Ars Islamica 7, 1940, pp. 20 -- 54. 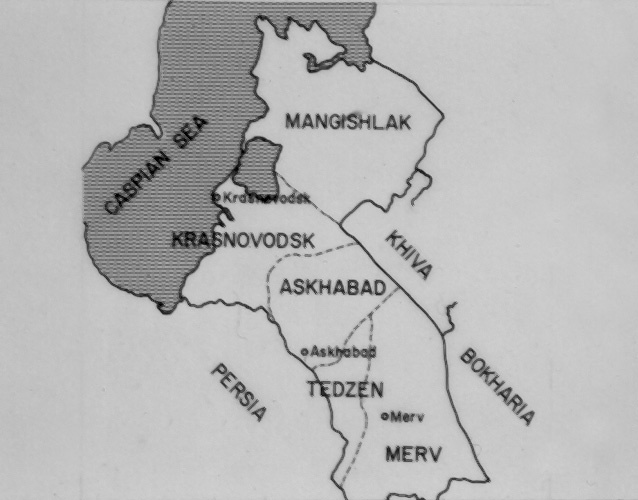 48...... Allworth, Edward A., The Modern Uzbegs, Stanford, 1990, p. 61, p. 247. 49...... Desmaisons, Petr. I. Histoire des Mongols et des Tatares par Aboul-Ghazi Behadour Khan, Philo Press reprint, Amsterdam, 1970, p. 215 ff. 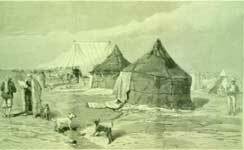 50...... Frye, Richard N., Bukhara, The Medieval Achievement, Norman, 1965, p. 185, p. 195.